Spectacular Death's first defeat of Steelbreaker in Ulduar, 11-12-10. WOW is the kind of game that you can play in pretty much any fashion you like. While running content solo can be done, it's clear the best benefits come from grouping with like-minded people and running content with them. I've known people who act as mercenaries, hiring themselves out for a piece of the loot or even being paid gold for their services. But the way the game is structured, the best and most productive experience is when you're in a guild. Finding a guild is an inexact science. Our very first "Casually Guilded" was about finding a guild that meets what you want out of the game. Let's say, however, that you have bounced around between a number of guilds, just not finding anything that truly meets what you want. Now days, more than when Spectacular Death, my guild, was formed, there are guilds for every time of day and every style of play, although finding them can be a somewhat daunting task. Let's take this idea a step further and say that you've done the things suggested in the article, but just haven't found a good fit. Let's say that you have an idea for what a guild should be and you think you'd like to try your hand at running one. How hard can this be? Before you cough up the money for a charter, pay people to sign the charter and design a tabard, I've got some things for you to think about. I've been leading Spectacular Death for 7 years. That's a long time in WOW history for a guild to exist. I don't have all the answers and there are days and weeks when I don't think I have any answers, but I'm going to toss out some observations based on these years of running a guild. First of all, how committed are you to running a guild? You cannot "set it and forget it", so to speak. Even if there are two of you who are co-guild leaders (something I do NOT suggest), you need to commit to being on more days during the week than you are off, if you want to get the guild up and running. Think about running a guild as running a business. It's your name over the door, to use a business analogy. Issues are yours to deal with. All of the things that happen in a guild and think of all the things you have done in guilds, come from someone and, generally, that someone is you. If you are in this to grow into even a small-size guild, unless it's family only, or just a guild for your bank alts, you need to make a commitment to the guild and to running it. The Battle of Mount Hyjal, 7-19-09. Second, what kind of guild do you want to be? 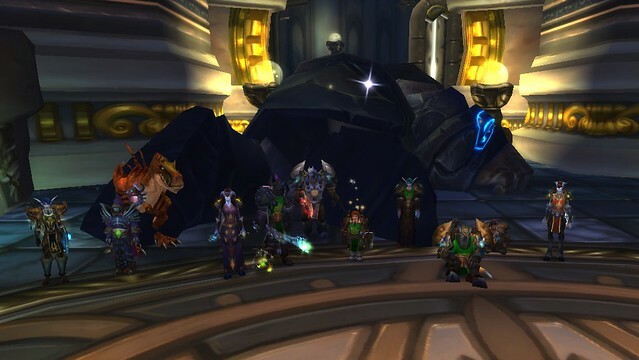 For example, when Spectacular Death was formed, the gentleman and I who funded its creation had been talking for months about how we'd never seen the classic WOW raids; Molten Core, Blackwing Lair and Ahn Qirag. No guild we knew was running that stuff. They were trying to clear Burning Crusades raids. We also did not want to raid in the "hard-core" fashion we had seen being advertised. So, we decided our niche would be what we called "retro-raiding", seeing the old content first before moving on. "We'll never be first into content, but we'll have the most fun when we get there" was, and still is, our statement of purpose. You need to decide what it is that you want out of the game. If you can only play from 5 a.m. to 11 a.m. because you work late evenings, then that's the kind of player to whom you will appeal. If you only want to PvP, then that's the kind of guild you'll create. Decide what you want to do within the game and decide who is your target guild member. Over 18; under 35; families; military only? LGBT? There are guilds out there for pretty much any subset, keep in mind, but this is not to say you can't start one and be wildly successful. One thing, however. If you decide that you're going to make a guild that raids current content in the evenings, you are going to fail. This is not a "maybe", this is a "will". Evening raiding guilds are a fraction of a penny a dozen. On any given day, if I stand in any major city, I can see 3-5 recruitment statements in General chat advertising the next incarnation of an evening raiding guild. There is nothing special or unique about a guild that wants to run current content from 8-11 three nights a week and 8-12 on Saturdays. You have to offer people something different, something they can't get in any other guild. You need, in advertising parlance, a "hook", something that makes them want to look you up and ask about the guild or to join it. Just deciding you don't like the raiding style of the last 3 guilds you were in is not a good reason to start your own and compete for the same raiders that every other guild competes for. Remember, even on a high population server, there are a finite amount of people available to join your guild. You have to have something those who are looking want so they want to join your guild. C'Thun downed on June 13, 2009. Thirdly, do you have friends willing to join you? Why should this matter? If you don't mind getting three strangers to sign your guild charter and then want to go it alone to populate your guild, have at it. But having friends join you as you set up the guild gives the new person, who finds your guild's purpose intriguing, a sense that it's not a spur of the moment idea; that you might actually have an idea and a timetable of what you want to do. Plus, even if it's a temporary term, your friends can fill officer slots to help you get up and running and then step down when you have more people in the guild, if they don't wish to continue. Fourth, draw up your rules and a statement of purpose before you plunk down money for a charter or before you have the signatures on that charter. Spectacular Death has a Code of Conduct. We drew it up 2 weeks after we formed. I had friends who signed the charter and agreed to be officers at the beginning. We spent 3 hours in a bar in what used to be the Park in Stormwind talking about goals and what kind of things we felt strongly about to make it into the Code. Since that day, the Code has been tweaked 3 times in 7 years, to reflect some things which happened to the guild which we never foresaw on that day. Every potential member is required to read the Code. We've been told that what we state is "common sense", but we've seen, repeatedly, that the sense is not common. You need to have, at the start, a statement on what is an isn't acceptable to be in your guild. If you are going to make a "mature" guild, you need to let potential members know that language can get salty. Spell out what is a kickable offense. I would also draw up raiding and bank rules. If you don't have these things "on paper" where potential members can read them, you will have someone do something, like take items from your guild bank and sell them in the AH to make money, and claim, when they are caught, that they didn't know they couldn't do that. You won't be able to prepare for everything that could happen; people are nasty opportunists; but if you plan for those things that you would kick someone over and what behavior is expected from potential members, you'll be many steps ahead. Taking over Freewind Post in Thousand Needles on 8-9-2009. Fifth, do you have money you can sink into your guild? From the initial payment for the charter, to the design of the tabard to all the bank tabs, and so much in between, you, as guild leader, will find yourself funding a lot. I quit keeping track at our 3rd anniversary but, at that point, I had given the bank over 50,000 gold in either money or goods to keep it going and to do the things I felt it was important for us to do. Your philosophy will vary, but I won't charge guild members dues. I know of guilds who do that. You pay a set amount, say 100 gold, every month, which is used to buy potions and materials for raiders. If you don't raid at all that month, you don't pay. We have contests in SD and I will give out personal loot as prizes. Be prepared to fund things because the guild bank has 26 gold, 18 silver and 77 copper in it. It's worse now because we don't have the Cash Flow perk which would return a lot of gold received from questing into the bank. We're doing okay, but if you're just starting out, be prepared to pay out of your own pocket to keep the guild going. Sixth, be prepared for paperwork. You'll need to have a list of goals and how soon you think you'd like to accomplish those. Be conservative. Current tier raiding always takes longer than you expect. If your goal is to simply clear the old stuff, you'll probably find most raids from Cataclysm and earlier take an hour to 90 minutes. But plan for a longer raid. Decide what guild achievements you'd like to get first. Everyone likes having a goal to shoot for. Again, if you are running a PvP guild and you think you can get the achievement, Blood Elf Slayer, in a month, add a couple weeks to that. Trust me on this. If you set the guild up for getting Horde Slayer within 3 months of forming, you will be disappointed when it doesn't happen. Always expect things to take longer and you'll be pleasantly surprised at how quickly people want to get achievements or do events. Decide what the ranks are and what they will be called. Decide what the qualifications are for each rank and when you will do promotions. Familiarize yourself with the things you can do under the "Info" tab on the roster. That's where you'll find the ranks. You'll also find bank permissions. Seventh, get yourself a copy of The Guild Leader's Handbook by Scott Andrews. He writes the "Officer's Quarters" column for BlizzardWatch. I found his advice to be spot on. The book is something I refer to again and again for tips in dealing with things you can't anticipate as you are leading a bunch of people around in the game. Lastly, be prepared to be frustrated, angry, irritated, saddened, exhilarated and moved by the kindness of your guild members. I've been all of these and every other emotion. When you're really angry, get out of the game. I've sent out very angry emails to officers that resulted in hurt feelings. (Don't do that. Cool off before sending out emails or in-game letters.) This is just like managing a team. There are going to be people pulling more than their share and people who are looking at the scenery and standing in stuff. There are times I want to reach through the computer and strangle someone. My cats are used to me yelling at the screen, "Just how stupid are you?" I sometimes feel that I'm not leading properly, that I have failed the guild in leadership. Having someone to talk to helps ease that feeling. Yet, even when we spend an hour beating our heads against a boss, I wouldn't trade the experience with people that I know; people I can laugh with; for all the current raid tier clears in the world.